Freshly inspired by all the adorable, yet functional, objects available in Taipei and Seoul, I decided to make a simple pen wrap so that instead of carrying a separate pencil pouch, I could just carry the notebook and pen together. 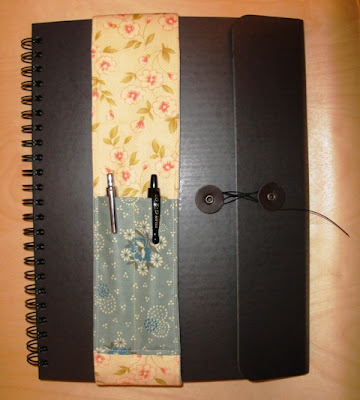 The design couldn't be simpler: simply adapt one of the many tutorial available out there for a coffee cup cozy and increase the size to fit around the cover of the notebook. The project came together very quickly so I can see myself making a bunch of them. Plus, this project is a great way to use up some leftover scraps or strips. Isn't travel great for all the wonderful ideas it can inspire?